Many stores in Southern California still have large stocks of good ol' incs, but I won't pay $5 for a pack! (grabs two shopping carts and fills them full of these and proceeds to the checkstand). GE? I'd like to find some of the old generic GE Safeway bulbs Vons used to sell, childhood memories! Interesting that you still allow 9 cents (0.99$ or 0.09$) in the cost of products. The law in Israel prohibits 9 agoras (0.99₪ or 0.09₪ but only 0.90₪) in the cost of products, since there are no 1 agura or 5 aguras anymore, only 10 aguras. 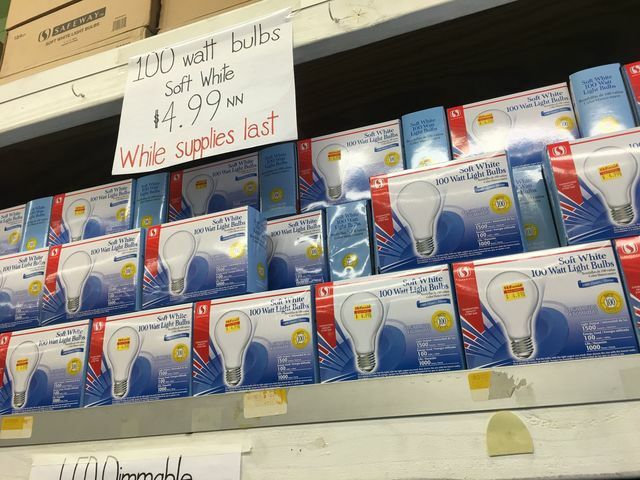 The cost here is indeed overpriced for a generic 100W incandescent lamp. 4.99$ = 18.40₪. Way over priced, I can get a four pack from the dollar store for a dollar, even if these Safeway ones last twice as long, the dollar store is still cheaper, and the while supplies last, they have millions left and at that price it looks like they will have them for a very long time as well..